How do you sum up the lives of six people into something so general as the history of a band? When it comes down to brass tacks, shouldn't it be six separate stories, with six different motivations, six different ideas about art, etc.? Sure, but who has the time? The short of the story begins-Crowder as a college student, sitting in his bedroom trying to figure out what to play on a Sunday morning. He and a friend had achieved no small task by starting a church for their fellow Baylor University schoolmates. But Waco, Texas is a strange place, and stranger things have happened there. Example: David Koresh. Example: Dr. Pepper. Another example: thousands of students at a Christian college, and almost half of them not stepping foot in any sort of church. So there is young Crowder, sitting on the floor of his apartment, listening to one cd after another with the goal of finding some good music to lead the congregation in. At this point, you might say that God intervened in the situation. That is if you believe that God would intervene in a situation in the form of your neighbor bursting through the door in a cloud of cigarette smoke, telling you that whatever you are listening to sounds like, well, something that cannot be printed here. Because that's what happened, and that's when Crowder decided it was time to write some songs that the students in his church could relate to, possibly for the first time in their lives. 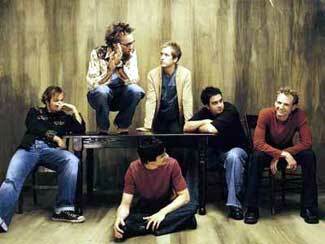 And thus, the birth of the David Crowder Band, so to speak. There are lots of little points worth knowing, though, as well as some larger ones. For instance, every member of the band found himself at the door of UBC, the church that David helped start, at one point or another. And some members were friends before they were in the band together. But it is the small details that make the story really interesting, though (isn't it always?). Like the fact that Dave asked Hogan to sit in with the band during his freshman year, only to be promptly turned down. Or that Dave originally started out on keyboards, and Jack Parker taught him the fundamentals of guitar playing. Or that Mike Dodson was supposed to go to med school, but decided to play bass instead? Or that B-wack played in a number of funk and punk bands before finding his way to the DCB? Try this one out; Solley and B-wack have been roommates for something like 8 years. Crazy stuff. The point is that the band is one unified thing, but also six completely different lives. And if you need another silly cliche, it is more than the sum of its parts. Its all working together to be a relevant force in our culture, to give hope to those who have left the church and those who have come back, to bring art back to the forefront, to reflect God's light as the moon reflects the sun. Six different people with the same goal, and six different ways to go about it. How interesting it would be to hear the individual stories. But who has time?